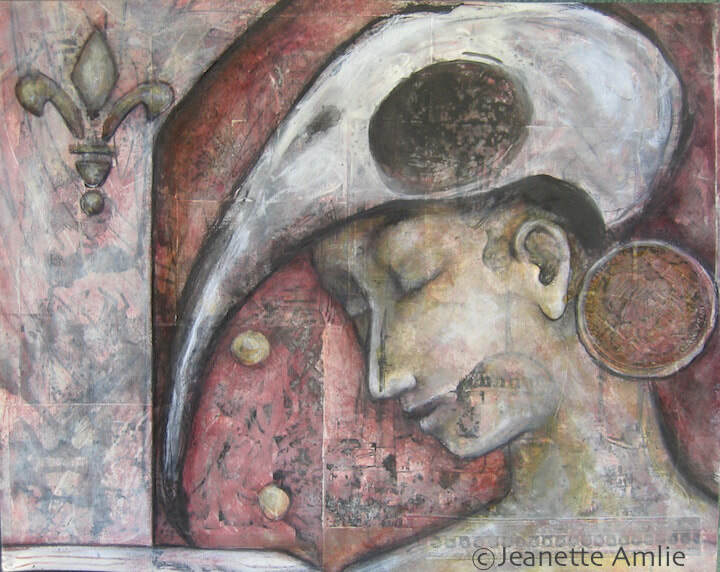 The Seer by Jeanette Amlie - 11"x14" mixed media collage on heavyweight watercolor paper. Come with me now and we will go together into the shadows to find the little spark that you hid long ago to keep it safe. Let Fear walk with us, for she has been shamed for too long. She is not an ailment or enemy, She is the very guide you seek. So let her walk with us and she might share what she knows, what she has seen and heard. Together we descend beyond the world of logic. Here the rational mind no longer rules. Now we are in the realm of murky memories, strange emotions and intangible sensations. They frighten you only because they are unfamiliar. Let them rise up and take their rightful place. They too have secrets to tell that hold the keys to all you seek.